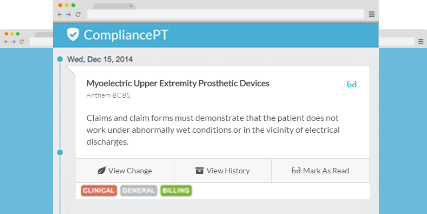 ﻿ Compliance PT – Get notified when payors change policies. 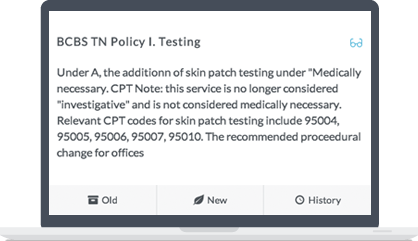 Receive notifications when Payors make policies changes. Staying informed makes all the difference. Instead of reading through hundreds of pages of insurance-speak, our software detects policy changes and writes easy-to-digest notes for your billing and coding staff to implement. Quickly find policy specifics for a given claim date. Use our data as evidence to win more cases. Get 30 days of CompliancePT PayorIQ email notifications FREE! Utilized by many practices like yours nationwide. Greenlight is extremely pleased to announce a cooperative marketing agreement with CompliancePT. The insights and policy guidance provided by CompliancePT are truly groundbreaking. The information will provide immediate and substantial revenue management benefits to our practices as they seek to improve patient outcomes with integrated Behavioral Health services. CompliancePT has developed a truly remarkable tool - highly sophisticated in its functionality, yet incredibly easy to deploy and utilize. Whether you are a single provider office or a multi-location practice group or health system you need this product. Providers are no longer defenseless against the mountainous volume of payor policies. We will be recommending this service to all our practices and partners. 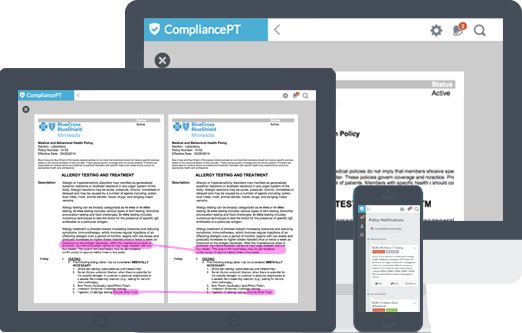 I would highly recommend CompliancePT to every practice that desires improved reimbursement outcomes. Use our powerful software standalone or integrate with your existing systems. Copyright © 2016 Compliance PT. All rights reserved.